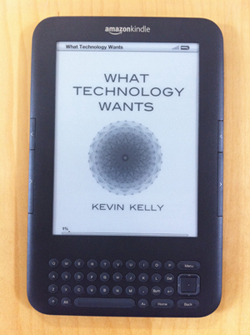 I was proudly updating a techie friend recently about the progress I’ve been making in my latest ebook conversion for Kevin. I’d mentioned it a few weeks prior. His response was not “That’s awesome!” but rather “Why does it take so long?” Not exactly what I was hoping for, but definitely a fair question. It took me about a week to remind myself how InDesign works (it had been at least a year since our last InD project), to learn how InDesign book documents (.indb) work, and to get up to speed with InDesign CS5.5’s new epub export features. I highly recommend the Lynda tutorials for that set of information. I also leaned on Liz Castro’s EPUB Straight to the Point and Rufus Deuchler’s How to Create an eBook with Adobe InDesign CS5 (still helpful post-CS5.5). 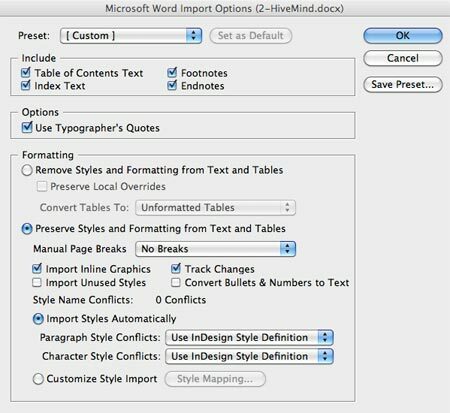 And since the cardinal rule of working in InDesign is to apply styles consistently, I found India Amos’ post on how she names and manages styles to be very helpful. I created a separate InDesign document for each chapter in the book. Chapter by chapter, I imported my text from Word (previously described here). After importing the first chapter, I started to create my character and paragraph styles. When creating subsequent chapter, I imported the styles from the previously created chapter. All chapters/documents were pulled into a single InD book file. I struggled a bit to remain mindful of my style source and to keep my styles synced. Once I finally got my InD book and styles all set up and my, I started to experiment with generating EPUBs. It took me another week to troubleshoot the errors I found during testing and validation. The first issue I came up against was related to images. I initially inserted very high-res images that resulted in a ginormous epub file. I replaced and relinked them in InDesign, but upon re-export, InDesign seemed to disregard my export settings. Instead of exporting at 150dpi, they came out at 72dpi, giving me the opposite problem of pixelated images. I posed the problem to the helpful folks who participate in the #eprdctn conversation, and @markerrett suggested replacing the images after export. This means unpacking the epub, navigating to the images folder, and replacing all of the images with images of the same name, created to the desired spec. Worked like a charm. I wrestled with embedded fonts. The first problem I had was with the descenders on the last line of text getting cut off. After taking Liz Castro’s advice and adding a font declaration to the META-INF folder, the descender problem was fixed. However, I was still getting validation errors relating to fonts (maybe because some were true-type instead of open-type?). Because the typography in this book was not complicated (one font is fine), I decided to re-export the epub WITHOUT any fonts embedded. Problem solved averted. One annoying but not crippling issue with EPUB created by InD is an excess of style sheet entries. I found some discussion of the issue at the Adobe forums, but I chose not to pursue “fixing” my CSS since it didn’t produce any errors and didn’t add significant size to my file. Finally, iTunes Producer didn’t like the spaces in the titles of my html files (which were a product of a naming scheme encouraged by the Lynda tutorial on working with book documents in InD). So, I renamed the files and then updated the toc.ncx and content.opf files. Even after removing the spaces from the html file names, Stanza would not display the document properly. There were several blank pages between each page of content, and, even more perplexing, the first two html files were omitted completely from display. I’m still not sure what was causing the trouble in Stanza – suggestions welcome! 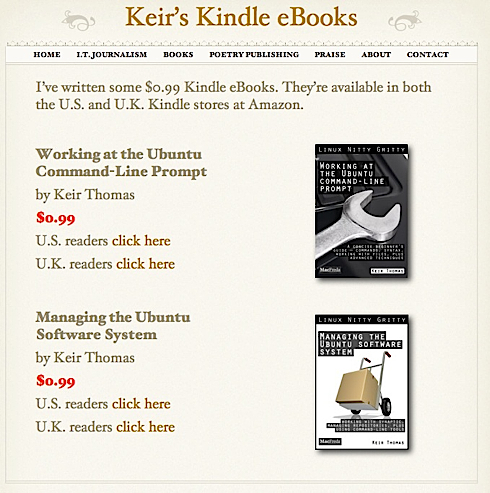 I did desk-top testing in Adobe Digital Editions, Ibis Reader, and in the EPUBReader FireFox extension. 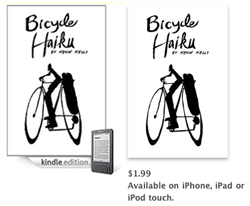 I also tested on an iPhone and iPad, in iBooks, Kobo, and Stanza. India Amos — How stylish are you? @pablod – Previews HTML components of an ePub file in Mobile Safari in the iOS emulator. Note: only good for previewing single pages (not full epub docs) – not a substitute for previewing on an actual iOS device, but in a pinch, it can help. 1. 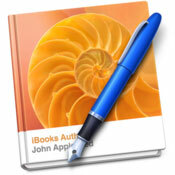 Break the single PDF into multiple PDFs by chapter. I’ll be using a Book organization in InDesign, which means creating a separate InDesign document for each chapter. For that reason, I’d like to import the text chapter-by-chapter. 2. Copy-Paste the text for each chapter into a separate Word document. Remove extraneous carriage returns. 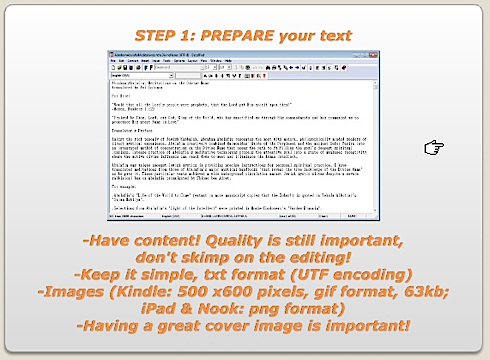 There are two main methods for getting text into InDesign. You can copy-paste directly into a text frame, but for big sections of text, this is not recommended. The better method (I think) is to use InDesign’s Place command (ctrl+D). To do this, text needs to be in a place-able format like TXT, DOC, or RTF. Because I’m working with formatted text, DOC or RTF are my best options. After a few rounds of experimentation, I find Word to offer the best tools for maintaining character formatting and eliminating extraneous line breaks. Depending on what happens upon paste (or paste special – I’ve experimented with all of the options and it seems like I get a different result each time), I may use AutoFormat to fix extra carriage returns while maintaining paragraph breaks. So far, these three steps seem to work pretty well. It seems like there’s a fair amount of variation in the way my pasted text lands in Word (especially in terms of the presence or absence of extra carriage returns). Also, although the first chapter I worked on seemed to transmit fairly clean text, in the second and third chapters I’m finding many instances of words running together (“inhalesthem” instead of “inhales them”). I suspect this is related to the carriage return issue. Although I’m not always seeing extra carriage returns, it seems like their absence is sometimes accompanied by a missing space. If anyone has a better workflow for getting styled text from PDF to InDesign, please share in the comments!